Operational factors that affect the multiplication in PWRs. Detailed knowledge of all possible operational factors that may affect the multiplication factor of the system are of importance in the reactor control. It was stated the keff is during reactor operation kept as near to the value of 1.0 as possible. The criticality of the reactor is influenced by many factors. For illustration, in an extreme case also the presence of human (due to the water, carbon, which are good neutron moderators) near fresh uranium fuel assembly influences the multiplication properties of the assembly. If any operational factor changes one of the contributing factors to keff (keff = η.ε.p.f.Pf.Pt), the ratio of 1.0 is not maintained and this change in keff makes the reactor either subcritical or supercritical. In most cases each operational change influences all coefficients in the six factor formula, but there is always dominant effect, that can be separated. For illustration, here are some examples of these operational changes and their impacts on keff, that may take place in PWRs. Control rods (insertion/withdrawal) influences the thermal utilization factor. For example, control rods insertion causes an addition of new absorbing material into the core and this causes a decrease in thermal utilization factor. where Σa is the macroscopic absorption cross section, which is the sum of the capture cross section and the fission cross section, Σa = Σc + Σf. The superscripts U, M, P, CR, B, BA and O, refer to uranium fuel, moderator, poisons, control rods, boric acid, burnable absorbers and others, respectively. It is obvious, that the presence control rods, boric acid or poisons causes a decrease in the neutron utilization, which, in turn, causes a decrease of multiplication factor. In comparison with the chemical shim, which offset positive reactivity excess in entire core, with control rods the unevenness of neutron-flux density in the reactor core may arise, because they act locally. The concentration of boric acid diluted in the primary coolant influences the thermal utilization factor. For example, an increase in the concentration of boric acid (chemical shim) causes an addition of new absorbing material into the core and this causes a decrease in thermal utilization factor. When compared with burnable absorbers (long term reactivity control) or with control rods (rapid reactivity control) the boric acid avoids the unevenness of neutron-flux density in the reactor core, because it is dissolved homogeneously in the coolant in entire reactor core. On the other hand high concentrations of boric acid may lead to positive moderator temperature coefficient and that is undesirable. In this case more burnable absorbers must be used. Moreover this method is slow in controlling reactivity. Normally, it takes several minutes to change the concentration (dilute or borate) of the boric acid in the primary loop. For rapid changes of reactivity control rods must be used. This operational change is very difficult to describe, because changes in moderator temperature lead to the change of almost all the coefficients. Major impacts on multiplication of the system arise from the change of the resonance escape probability and the change of total neutron leakage (see thermal non-leakage probability and fast non-leakage probability). Change of the resononce escape probability. 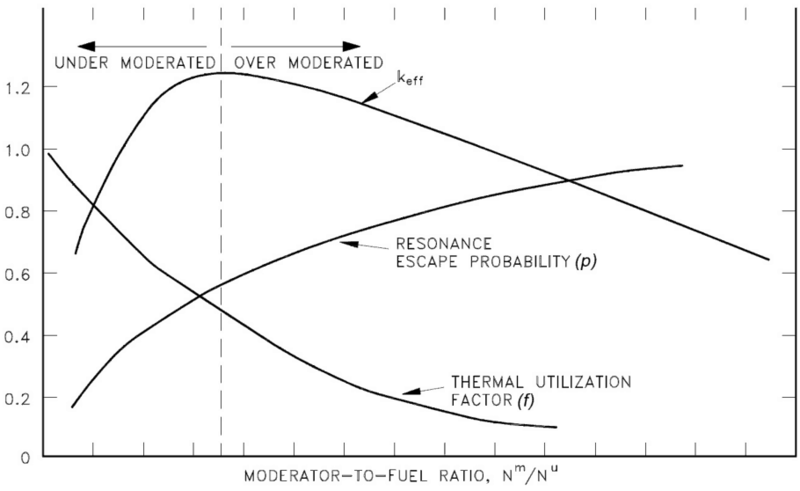 It is known, the resonance escape probability is dependent also on the moderator-to-fuel ratio. All PWRs are designed as undermoderated reactors. As the moderator temperature increases the ratio of the moderating atoms (molecules of water) decreases as a result of the thermal expansion of water. Its density simply decreases. This, in turn, causes a hardening of neutron spectrum in the reactor core resulting in higher resonance absorption (lower p). Decreasing density of the moderator causes that neutrons stay at a higher energy for a longer period, which increases the probability of non-fission capture of these neutrons. This process is one of two processes, which determine the moderator temperature coefficient (MTC). The second process is connected with the leakage probability of the neutrons. The moderator temperature coefficient must be for most PWRs negative, which improves the reactor stability, because a reactor core heating causes a negative reactivity insertion. 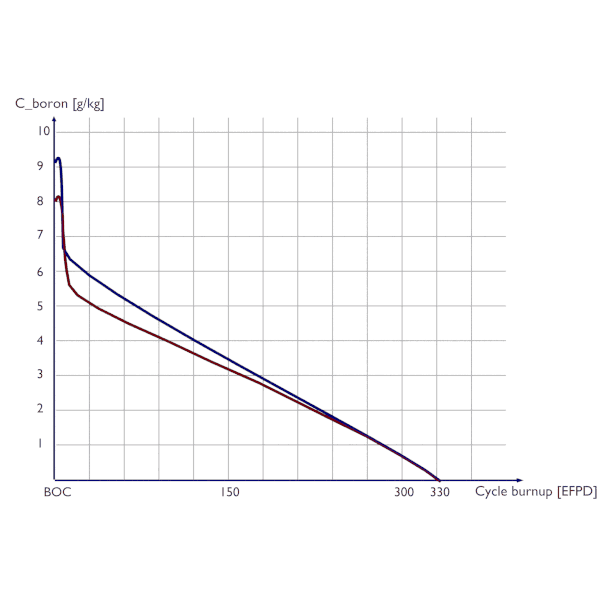 Boron letdown curve (chemical shim) and boron 10 depletion during a 12-month fuel cycle. Change of the thermal utilization factor. The impact on the thermal utilization factor depends strongly on the amount of boron which is diluted in the primary coolent (chemical shim). As the moderator temperature increases the density of water decreases due to the thermal expansion of water. But along with the moderator also boric acid is expanded out of the core. Since boric acid is a neutron poison, and it is expanding out of the core, positive reactivity is added. The positive reactivity addition due to the expansion of boron out of the core offsets the negative reactivity addition due to the expansion of the moderator out of the core. It is obvious this effect is significant at the beginning of the cycle (BOC) and gradually loses its significance as the boron concentration decreases. Change of the neutron leakage. 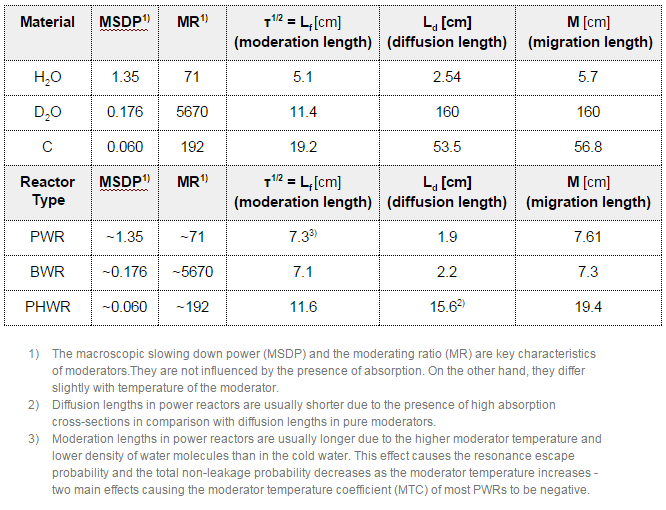 Since both (Pf and Pt) are affected by a change in moderator temperature in a heterogeneous water-moderated reactor and the directions of the feedbacks is the same, the resulting total non-leakage probability is also sensitive on the change in the moderator temperature. In result, an increase in the moderator temperature causes that the probability of leakage increases. In case of the fast neutron leakage, the moderator temperature influences macroscopic cross-sections for elastic scattering reaction (Σs=σs.NH2O) due to the thermal expansion of water, which results in an increase in the moderation length. This, in turn, causes an increase of the leakage of fast neutrons. For the thermal neutron leakage there are two effects. Both processes have the same direction and together causes the increase in the thermal neutron leakage. This physical process is a part of the moderator temperature coefficient (MTC). Macroscopic cross-sections for elastic scattering reaction Σs=σs.NH2O, which significantly changes due to the thermal expansion of water. As the temperature of the core increases, the diffusion coefficient (D = 1/3.Σtr) increases. Microscopic cross-section (σa) for neutron absorption changes with core temperature. As the temperature of the core increases, the absorption cross-section decreases. 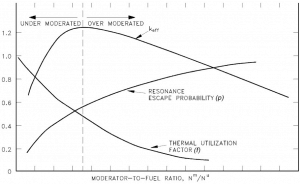 Change in the fuel temperature affects primarily the resonance escape probability, which is connected with the phenomenon usually known as the Doppler broadening. The Doppler effect is generally considered to be most important effect, which improves the reactor stability. Especially in case of reactivity initiated accidents (RIA), the Doppler coefficient of reactivity would be the first in the compensation of the inserted positive reactivity. The time for heat to be transferred to the moderator is usually measured in seconds, while the Doppler coefficient is effective almost instantaneously. The Doppler broadening with the process of self-shielding causes, that the Doppler coefficient (or the fuel temperature coefficient) is for all power reactors always negative. Therefore an increase in the fuel temperature promptly causes an increase in the resonance integral (Ieff), which, in turn, causes a negative reactivity insertion. It is of the highest importance in the reactor safety. Although water is considered to be incompressible, in reality, it is slightly compressible (especially at 325°C (617°F)). It is obvious, the effect of pressure in the primary circuit have similar consequences as the moderator temperature. In comparison with effects of moderator temperature changes, changes in pressure have of lower order impact on reactivity and the causes are only in the density of moderator, not in the change of microscopic cross-sections. The pressure coefficient of reactivity has a slightly positive effect on reactivity as the pressure of the system is increased if. At high boron concentrations, the pressure coefficient may reach negative values, but for many PWRs it is prohibited to operate under such conditions. Therefore burnable absorbers are usually added into the fuel, they lower initial boron concentration. Note: Effects of the nuclate boiling of the primary coolant are not discussed here. The inlet temperature is determined by the pressure in the steam generators, therefore the inlet temperature changes minimally during the transient. It follows the outlet temperature must change significantly as the flow rate changes. When the inlet temperature remains almost the same and the outlet changes significantly, it stands to reason, the average temperature of coolant (moderator) will change also significantly. Therefore the effect of change in the flow rate through the primary circuit have identical consequences as the effects of the moderator temperature. The decrease in flow rate is associated with negative reacivity insertion. Special attention is needed in case of an abrupt increase in the flow rate. At normal operation such increase in the flow rate can not occur, except the controlled reactor coolant pump connection, which can be connected only under specific conditions. In pressurized water reactors, nucleate boiling may occur even during operational conditions. Nucleate boiling occurs when any surface of fuel cladding reach the saturation temperature (e.g. 350°C), which is determined by the pressure in the pressurizer (e.g. 16MPa). Such local nucleate boiling does not pose any problem for the reactor operation. On the other hand during abnormal condition, boiling in the reactor core is one of the most important phenomena, that may take place in the core. From the reactivity point of view, nucleate boiling have very important consequences on the reactivity of the reactor core. Boiling affects reactivity in the same manner as the presence of voids and therefore it is characterized by the void coefficient. The formation of voids in the core has the same effect as the change in the moderator temperature (change in the density of the moderator). In comparison with the change in the moderator temperature, boiling minimally affects the neutron leakage, because it is unlikely that local boiling occurs at the periphery of the reactor core, where the local power drops significantly. The amount of burnable absorbers in the nuclear fuel influences the thermal utilization factor. In some cases (espacially in the case of gadolinium absorbers) the presence of burnable absorbers influences all the factors in the four factor formula due to very high self-shielding effects. But at this place we consider only the change in the thermal utilization factor. An increase in the amount of burnable absorbers causes an addition of new absorbing material into the core and this simply causes a decrease in thermal utilization factor. The effect of gadolinium burnable absorbers (BA) can be demonstrated on boron letdown curves. 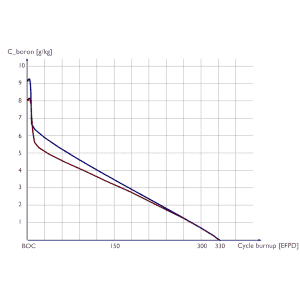 At the beginning of specific fuel cycle the critical concentration of boric acid in the reactor core without burnable absorbers (blue curve) significantly differs from the critical concentration of boric acid in the reactor core with burnable absorbers (red curve). The difference is dependent on the amount of BA used. where Σa is the macroscopic absorption cross section, which is the sum of the capture cross section and the fission cross section, Σa = Σc + Σf. The superscripts U, M, P, CR, B, BA and O, refer to uranium fuel, moderator, poisons, control rods, boric acid, burnable absorbers and others, respectively. It is obvious, that the presence control rods, boric acid or burnable absorbers causes a decrease in the neutron utilization, which, in turn, causes a decrease of multiplication factor. It is hard to describe the effects of fuel burnup on the six factor formula. It must be noted, the criticality must be maintained for long period and therefore all the negative effects must be compensated by the increase in the thermal utilization factor (boron dilution or compensating rods withdrawal). The thermal utilization factor slightly changes with the fuel burnup. The fresh fuel at the beginning of the cycle comprises only the absorption by the 235U. 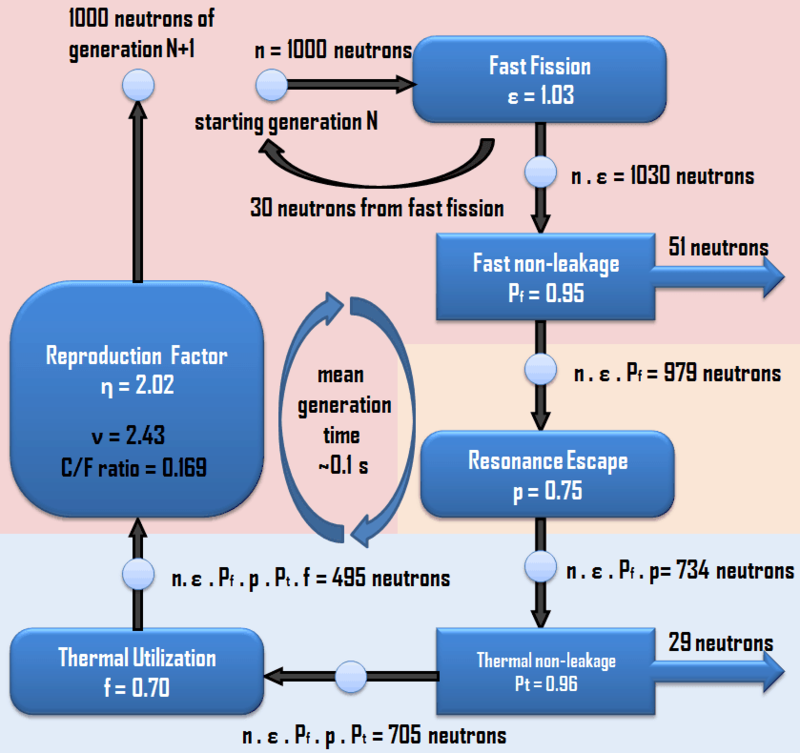 As the amount of 239Pu and other higher transuranic elements increases because of the radiative capture of neutron by the 238U in the core, it is necessary to consider the change of fuel composition in determining the value of f at different times of the fuel cycle. In general, the thermal utilization factor decreases in time as the total content of fissile isotopes decreases and the total content of neutron poisons (fission products with high absorption cross-sections) increases. But in the power reactors, in which the criticality must be maintained for long period (e.g. 12-month or up to 24-month) without refueling, the thermal utilization factor may not decrease. Such the decrease would imply inevitable reactor shutdown. The continuous decrease in ΣaU must be offset by the continuous decrease in ΣaB, which means the concentration of boric acid (in case of PWRs) must be continuously decreased as the fuel loses its reactivity (kinf). For reactors, in which the chemical shim can not be used, the excess of reactivity is compensated by compensating rods. There is essentially small change in η over the lifetime of the reactor core (decreases).This is due to the fact there is a continuous decrease in ΣfU, but on the other hand this decrease is partially offset by the increase in ΣfPu. As the fuel burnup increases, the 239Pu begins to contribute to the neutron economy of the core. In power reactors, the total non-leakage probability also significantly changes with fuel burnup. This dependency is not associated with any of the parameters like the diffusion coefficient or the geometrical buckling. In power reactors, the total non-leakage probability strongly depends on the certain fuel loading pattern and also on the reload strategy. The neutron leakage is one of key parameters in the neutron and fuel economy. In order to enhance the neutron and fuel economy, core designers designs the low leakage loading patterns, in which fresh fuel assemblies are not situated in the peripheral positions of the reactor core. The peripheral positions are loaded with the fuel with highest fuel burnup. These “high” burnup assemblies have inherently lower relative power (due to the lower kinf and due to the fact they feel the presence of non-multiplying environment) in comparison with the average assemblies. In short, this parameter is significantly dependent on the certain loading pattern. During fuel burnup, the neutron leakage usually increases, especially in low leakage loading patterns. This process is caused by reducing the differences in kinf between fresh fuel assemblies and peripheral high-burnup assemblies.